The 2018 Peace Perceptions Poll was conducted at a time of rampant global conflicts rendering millions of people traumatized, injured, killed or displaced. It is a context of international great power rivalry and incessant downgrading of global norms such as human rights protection and adequate provision of humanitarian aid. The Poll inquired into the views on peace and conflict of more than 100,000 people from 15 countries. It spanned countries with active and virulent crisis such as Nigeria, Syria and the Democratic Republic of the Congo- DRC, to states that enjoy relative peace and stability such as the UK, Hungary and the US. Among the multiplicity of questions, were perceptions and experiences of violence, visions of security and peace and ideas for governmental policies on conflict resolution. Overall, the respondents share a concern for the inefficient but growing global trend towards short-term crisis response. They emphasize on the pressing need to invest in long-term conflict resolution, or sustainable peacebuilding. The latter strategy is firmly based on eradicating the undergirding causes of conflict whilst equipping societies with the tools to resolve conflicts in a peaceful manner. Importantly, whilst the findings demonstrate the diversity of experiences when it comes to various conflicts in diverging circumstances, it illustrates the common aspirations and ideas that people have on building and maintaining peace (Peace Perception Polls 2018). Specifically, the way peace and conflict were conceived of in the eyes of people living in relatively stable versus conflict-ridden areas, tended to diverge significantly. Whereas those living in some of the most dangerous environments, such as the DRC, Syria or Nigeria shared a common optimism about the future prospects of peace, their counterparts in mostly peaceful UK, Brazil, the US or Hungary felt way more pessimistic about peace and security. Among the most prevailing concerns were terrorism, harassment by state authorities, criminal violence, religious, ethnic and tribal conflict, and domestic violence. Moreover, among the many factors underpinning ideas on positive peace or the general absence of violence, were resolution of disputes without violence, the presence of less amounts of crime and violence, the ability to vote in national elections and the possibility to earn enough money as to support a family. However, the respondent indicated few necessary conditions for the realization of the aforementioned factors. Within these, political and economic inclusion were ranked the highest. Herein, particularly in South Africa and the DRC political exclusion was perceived at highest levels. Additionally, political corruption was another cause for the lack of political agency, and as such was felt mostly among respondents from Nigeria, Ukraine and South Africa. Notwithstanding the amounts of fake news and propaganda prompting violence and discrimination that permeate social media and the internet, both of them were ascribed a central role when it comes to growing levels of exerted political influence. 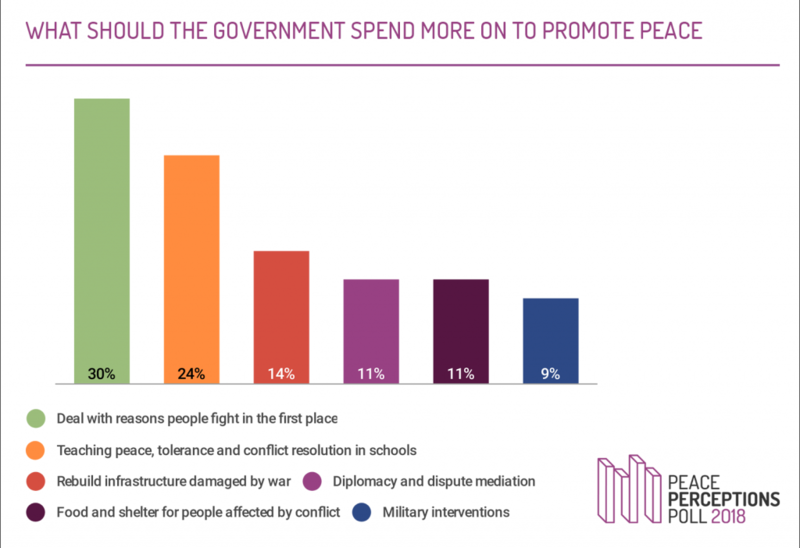 Finally, concerning governmental policies on promoting peace and conflict resolution, the most common responses spanned resolving the primary reasons for eruption of conflicts, increased educational tools on peacebuilding, tolerance and conflict resolution in schools, rebuilding infrastructure damaged by war and deploying diplomatic and dispute mediation instruments (Peace Perception Polls 2018).